Drawing from Ayurvedic traditions of India, Nature’s Sunshine blends herbs that promote skin health in its Ayurvedic Skin Detox. The formula nourishes the largest organ of the body which faces many stressors resulting from continuous contact with the environment. 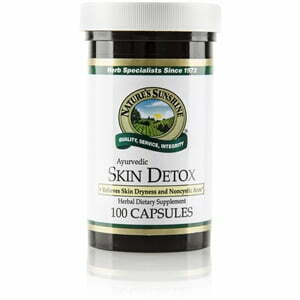 Ayurvedic Skin Detox supports the skin’s detoxifying function and encourages an overall state of well-being. HSN-W® is the formula’s Nature’s Sunshine Western counterpart. Instructions: Take two capsules with a meal three times daily. For best results use with BP-X (Blood Purifier Formula) and Irish Moss Hand and Body Lotion.